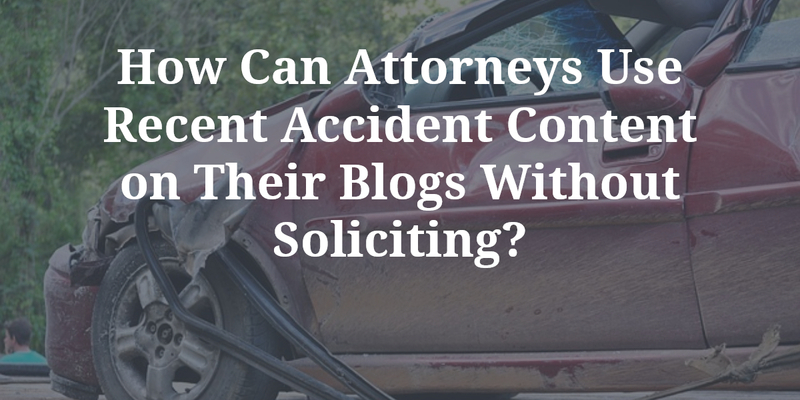 Home → Content Creation → How Can Attorneys Create Accident Content Without Soliciting re: ABA? Note: A simpler version of this article is here: Can Attorneys Blog About Recent Crashes? If an attorney has a website, whoever governs his or her conduct as an attorney is going to be looking over their shoulder. If an attorney has a blog on their website, it might be subject to even more scrutiny. Just about anything that an attorney says on that blog might be construed to be promoting himself or herself. Much depends on where the attorney’s practice is located. There’s no uniformity between the various jurisdictions on what may or may not be acceptable. Some states have rendered decisions on the permissibility of certain online conduct while others haven’t. If an attorney’s state hasn’t, that doesn’t mean that he or she won’t get burned on something that was posted 18 months ago. Regardless of whether an attorney’s blog content is regulated or not, the attorney should always remain mindful of the fact that just about everything said in a blog constitutes advertising. If it’s not regulated today, it’s likely to be regulated sometime in the future, and what an attorney writes today could be the subject of an inquiry two years from now. Legal advertising regulation doesn’t necessarily apply to factually accurate writings about recent accidents. It primarily turns on false or misleading statements about a lawyer, his or her abilities or his or her services. If a part of a blog describes an attorney’s specific achievements without appropriate information detailing the facts and circumstances surrounding a case, the blog or portion thereof might be deemed to be misleading, even if there’s no controlling authority in a state. Simple common sense tells us that lawyers don’t devote the time and expense of setting up a website unless they expect to derive some type of financial advantage from it. Most are directly or indirectly soliciting business, and attorney solicitations are regulated in most states. Some highly limited solicitation exceptions might exist for friends, family members and former clients, but when is a friend something more than a mere acquaintance or even just a Facebook friend? Where does the analysis of all of this begin? If a state has rules or cases governing lawyer advertising and solicitation, read those first. If it doesn’t, the American Bar Association Model Rules 7.1 to 7.4 have guided several states. They address the content of advertising, how and where lawyers are allowed to advertise, appropriate disclosures and solicitation. Think of what is being said, and put it in the context of the American Bar Association Model Rules 7.1 to 7.4. You’ll develop a sense of what might and might not be compliant. Remember that when a lawyer is blogging, it’s highly likely that he or she is advertising. Advertising is permitted. Solicitation is forbidden. Teaching the public about the law is one of the social responsibilities of being an attorney, but the facts surrounding recent accidents must be laid out clearly and objectively. If there’s no preexisting relationship, lawyers shouldn’t even try to solicit. There’s nothing mystical about the solicitation line that’s been drawn. It’s all about friends, family and former clients.